Durable & dimpled. 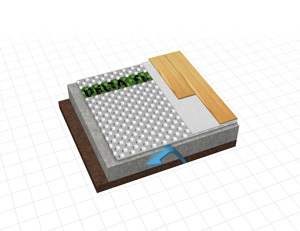 The Warm & Dry Subfloor System from Delta is designed to elevate and isolate the basement finish floor. The floor in your finished basement doesn’t need to be cold and damp. Basement carpeting doesn’t have to get moldy from moisture that comes up through the concrete. To avoid these problems, we install the Delta® Warm & Dry Subfloor System beneath finished basement floors. It’s also a great subfloor treatment over concrete on enclosed patios and porches. Contact BlueMaxx Basement Systems to schedule an inspection and to learn whether this concrete floor vapor barrier system is right for your home! 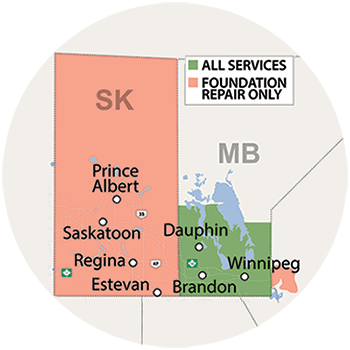 Our basement waterproofing services are available throughout Greater Winnipeg, including Winnipeg, Brandon, Portage La Prairie and nearby. You’ve probably been down in a basement that had moldy carpeting or other flooring that showed signs (and smells) of moisture damage. This happens because the concrete slab floor is constantly absorbing and releasing moisture from the soil below. Properly installed finished flooring in a basement must be isolated from the slab’s moisture and cold temperature by a thermal & moisture barrier. That’s why the Delta Warm & Dry Subfloor System was developed. The system consists of a dimpled polyethylene membrane that is rolled onto the concrete floor, and moisture-proof tape used to join and seal adjacent membrane rolls together. Basement flooring done right. Delta-FL moisture barrier can be installed underneath laminate flooring, carpets, hardwood flooring and more to ensure the beauty and health of your basement. Effective moisture barrier. The durable plastic membrane effectively blocks moisture migration from the slab, protecting finish floor materials from harmful moisture exposure. Drainage air space. The dimpled design of Warm & Dry sheet material promotes drying and drainage of moisture that may collect on the slab surface. Permanent. The polyethylene sheet material can’t support mold growth or be damaged by water. It’s extremely tough, with plenty of compressive strength (exceeding 5200 lb. per sq. ft.) to support heavy loads. Warm floor solution. The airspace created by the dimpled underlayment provides insulation value to keep the floor temperature comfortable. Versatile. Warm & Dry subflooring can be used in other slab-on-grade applications, like enclosed patios or porches with poured concrete floors. It’s an excellent subfloor for laminate or prefinished engineered wood flooring. Get your dream basement underway today! Call our toll-free number to schedule a free basement waterproofing consultation. Give us a call at 1-855-219-5311 or contact us online to get started. We provide Free Estimates in Brandon, Winnipeg, Portage La Prairie, Selkirk, Dauphin, Steinbach, Thompson, St Andrews, Winkler, Morden and throughout the surrounding area. We also install the Delta®-MS waterproofing membrane!